The small size (100-200 microns) of this zooplanktonic organism allows them to be easily ingested into the mouths of baby fish. Naturally enriched by microalgae, rotifers are highly digestible. Our convenient freeze-dried form of this widely used feed enables anyone to deliver nutrition to their valuable aquarium fish without the hassle and unpredictability of live cultures or "greenwater." Scale-up your production with confidence! Freeze-dried Rotifers are nutritious and affordable. Packing as raw material in 9kg bags or packed in small packings according to customer requirements. Freeze Dried Daphnia is great for all tropical and marine fish, soft corals and anemones. It is excellent for use during medicating as a delivery agent and after as an intestinal cleanser that is free of parasites and harmful bacteria. Enriched with multi-vitamins to reduce stress and stress related illness. The drying process maintains original nutrition, flavor and texture previously only available with live daphnia. Oxygen absorbers and nitrogen charging significantly reduce oxidation. Quickly softens when put in water. The FD Artemia is 100% top quality natural pet fish food without any additive, which is freeze-dried after special cleaning procedure. The salt and other no use objects are removed. It doesn’t pollute the water without any infect disease absolutely. It is the best natural nutrition pet fish food for substitution of live Artemia and frozen Artemia. It is fit for various sea fish and river fish. Suitable pet fish: Lamp fish, Discus bits, Parr and so on. Ingredient Analysis: Crude protein 54%, crude fat 9%, crude fiber 4%, moisture: 5% and containing natural carotene. The FD Bloodworm is 100% top quality natural pet fish food with any additive. It doesn’t pollute the water without any infect disease absolutely. It is the best natural nutrition pet fish food for substitution of live Bloodworm and frozen Bloodworm. Suitable Pet Fish: Golden Fish, Beautiful Carp, Cichild, Discus Bits, Medium and small _tropical and so on. Ingredient Analysis: Crude protein 55%, crude fat 3%, crude fiber 7%, moisture 5%. Mysis Shrimp are one of the most nutritious and readily accepted foods for almost all fresh and saltwater aquarium fish, such as tetras, cichlids, livebearers, angels, barbs, butterflys, clownfish and gobies. Freeze Dried Mysis are just as nutritious as live food without the risk of parasites. Mysis shrimp also make an excellent nutritious treat for turtles, frogs and other amphibians. 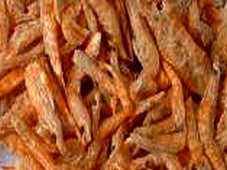 Freeze Dried Red Shrimp is a nutritious supplement to other dried fish foods. These shrimp, including the shell, are an excellent source of protein as well as roughage for all tropical and marine fish. FD Red Shrimp is specially processed and tested to help minimize the presence of unwanted toxins and undesirable organisms that may be found in live shrimp. The FD Tubifex is 100% top quality natural pet fish food without any additive. It doesn’t pollute the water without infect disease absolutely. It is the best natural nutrition pet fish food for substitution of live Tubifex and frozen Tubifex. It is fit for various sea fish and river fish. Suitable Pet Fish: Small and medium tropical fish, golden fish, Africa fish, fight fish, and so on. FD Krill is a carotene-rich, small shrimp species which lives in the ocean and mainly feeds on plankton. sera FD Krill is very high in protein and is therefore ideally suited to strengthen fish or increase the readiness to spawn. FD Krill is a valuable addition to the diet of all finicky and larger fish. Ideal for increasing the spawning behavior in many species of fish. Grasshoppers: The product has abundant protein and fat. It keeps the original taste after freezing. The fish likes it very much. Suitable Pet Fish: Arowana, large and medium cichilds. Freeze Dried Gammarus is a nutritious supplement to other dried fish foods. These complete shrimp, including the shell, are an excellent source of protein as well as roughage for all tropical and marine fish. FD Gammarus is specially processed and tested to help minimize the presence of unwanted toxins and undesirable organisms that may be found in live shrimp. Freeze dried plankton food for small and fry fish such as neon tetras. FD Cyclops contains the crustatian ’copepodes’ from the arctic , which feed mainly on protein rich spirulina algae. Freeze Dried Silkworm Pupae - treat your Koi and pond fish to a real delicacy. 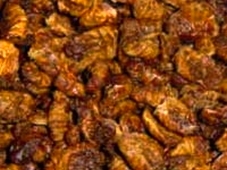 100% dried silkworm pupae. Naturally, high in protein, calcium, and additional nutrients that promote vibrant luster and growth. The Larva of the silkworm will molt four times. The silk cocoon is shades of white, cream and yellow, depending on the silkworm’s genetics. After the final molt inside the cocoon, the Larva develops into the brown, chitin covered structure called the pupa. Silkworm pupae are consumed by humans in many Asian countries. Directions - Use as a dietary supplement and/or treat. Only feed when water temperature is above 60°F / 15.5°C. Do not overfeed. Ingredients - 100% dried natural silkworm pupae. The FD crickets is better than live crickets, which can prevent the fish from disease infection completely after vacuum drying. It contains many nutrition.